Poc choi is a type of Chinese cabbage with flared jungle green leafy blades with thick translucent and succulent white stalks that join at a common base above the root. Though the plant is entirely edible, the leaves are the most tender and mild part of the plant. The stalks are firm and succulent with notable cabbage nuances and sweet under tones. Health Benefits of Poc Choi: a excellent source of vitamin K, vitamin C, vitamin A (in the form of carotenoids), potassium, folate, vitamin B6, calcium and manganese. It is a very good source of iron, vitamin B2, phosphorus, fiber and protein as well as a good source of choline, magnesium, niacin, vitamin B1, copper, omega-3 fatty acids, zinc and pantothenic acid. 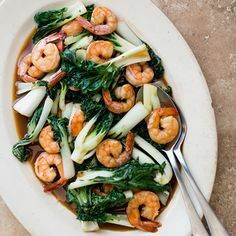 Boy choy also provides flavonoids including quercetin, kaempferol and isorhamnetin, as well as numerous antioxidant phenolic acids, including hydroxycinnamic and malic acid. Trim ends of poc choi. Wash, pat dry with paper towels, and then set aside. Heat a large skillet or wok over medium-high heat. Add oil and then add ginger. Cook for 1 minute or until soft, and then add shrimp. Cook for about 1 minute on each side, or until shrimp is seared and cooked through. Stir in soy sauce, sake (or vermouth), brown sugar, and rice vinegar and cook for 1 minute. Stir in poc choi and cook for 1 minute, or until poc choi is cooked and the sauce is heated through. Add the tamari, then the poc choi, turning to coat in the oil and seasoning. Add ¼ cup of water and cover the pan with a lid. Steam the bok choy until the stem end is tender, about 4 or 5 minutes. Add more water if necessary. Make a slurry of the cornstarch with some water. Push the poc choi to the sides and pour the slurry into the center, stirring to make a sauce. It should thicken and become glossy. Remove the poc choi to a platter, pour the sauce over top and garnish with the sesame seeds. Heat coconut oil in a pot or large skillet, over medium fire. Add half of the minced ginger and cook until aromatic, about 30 seconds. Add in sliced mushrooms and cook for about 4 minutes. When the liquid begin to evaporate, add in our Thai BBQ Seasoning and turmeric powder. Stir to mix in. Add in broth/water and tofu cubes, and bring it to a boil. Add in the remaining minced ginger. Lower heat to medium, and add in coconut milk. Stir gently to combine. Let cook for another minute. Season with our Sweet Ginger Sea Salt. Taste, and adjust any seasonings to your taste. 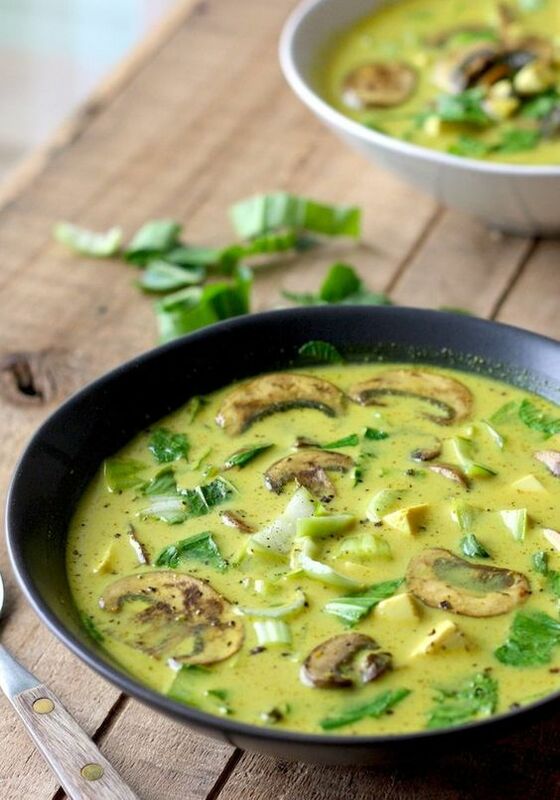 If you like the soup to be a richer consistency, just add in a bit more of the coconut milk. Remove from heat. Stir in the poc choi to lightly wilt. Serve hot or warm.